When he discovered Martinique in 1493, Christopher Columbus gushed that it was “the most beautiful country in the world”. Since then this island has lost little of the magic that so captivated the great explorer: it remains one of the most beautiful destinations you are likely to visit. Originally inhabited by Arawak and Carib Indians, who were swiftly eradicated by the French, the island has been hotly fought over. The British made numerous attempts to occupy Martinique during the 18th and 19th centuries, but it has remained defiantly French since 1635 (along with nearby Guadeloupe). 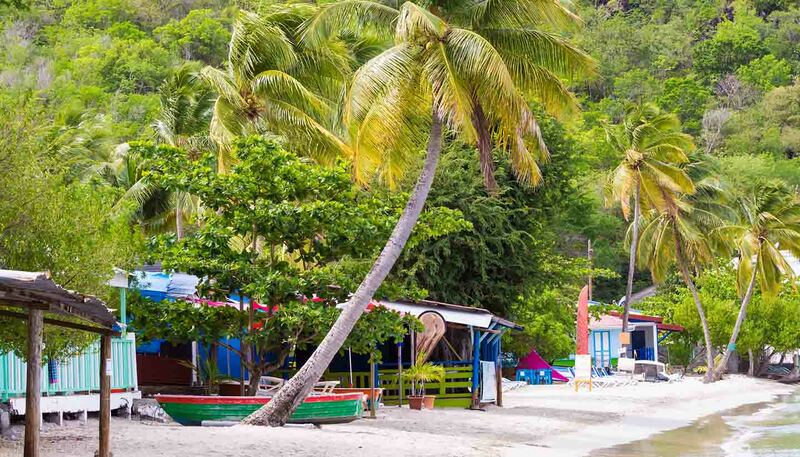 Tourism represents a major part of the local economy and each year hundreds of thousands of visitors come to enjoy Martinique's picturesque volcanic landscape, luscious rainforests and fine beaches, which are lined with sugar, palm, banana and pineapple plantations. An accommodating people, most Martinicans are of mixed ancestry, being the descendants of 17th century French settlers and slaves brought from Africa to work on the island's plantations. This French and Creole heritage is infused in local customs, food and languages, which is a joy for travellers. Do make sure you pack your dancing shoes. It’s impossible to escape zouk, the lively, two-beat local music that is similar to merengue in the Dominican Republic, but is unique to the French West Indies. Martinicans are very proud of their zouk, which will provide the soundtrack to your trip. If you need a bit of Dutch courage to get on the dance floor, you’re in luck, because Martinique produces fine rum. So exceptional is the liquor, in fact, that it was awarded the prestigious French label appellation d'origine controlee, which was previously only reserved for mainland produce. 1,100 sq km (425 sq miles). Martinique is an Overseas Department of France and as such is an integral part of the French Republic. President Emmanuel Macron since 2017, represented by the prefect Franck Robine since 2017. President of the Executive Council Alfred Marie-Jeanne since 2015. Several thousand British nationals visit Martinique each year. Most visits are trouble-free. Although there’s no recent history of terrorism in Martinique, attacks can’t be ruled out. Martinique is a French overseas territory. Consular support may be limited in Martinique. However, the British Embassy in Paris, France can provide consular support to British nationals. Avoid isolated areas, including beaches, after dark. Do not carry large amounts of cash or jewellery with you. Use a hotel safe for your passport, credit cards and valuables. Martinique is an Overseas Department of France (département d’outre-mer). If your passport describes you as a British Citizen you will not need a visa to enter Martinique. Other British passport holders should check the current entry requirements on the website of the French Foreign Ministry and if necessary confirm with the nearest French diplomatic mission. If the UK leaves the EU without a deal, the current visa policy for British Citizens visiting Martinique may change. We are working with the relevant authorities to clarify entry requirements for British nationals and this page will be updated as soon as further information is available. If you would like more details in the meantime, or want to discuss a specific issue, you should consult the French Embassy in London. UK ETDs are accepted for entry, airside transit and exit from Martinique. Cases of Chikungunya virus have been confirmed in Martinique and the number of reported cases in the region is increasing. You should take steps to avoid being bitten by mosquitoes. Dengue fever is common on Martinique. This is a mosquito-borne virus. Follow the advice from local authorities. If you display symptoms, consult a doctor. General health care facilities, including emergency services in hospitals, and the availability of doctors, are very good and of an equivalent standard to those found in mainland France. Specialist treatment is also available. You should get a European Health Insurance Card (EHIC) before leaving the UK. The EHIC provides emergency health cover for treatment in Martinique by the French state health service for which you will have to pay but you will be able to claim back up to 70% of the costs on your return to the UK. Visitors travelling (or being air lifted) to Martinique from other non-French islands specifically for medical treatment should be aware that such treatment will not necessarily be covered. Make sure you have adequate travel health insurance and accessible funds to cover the cost of any medical treatment abroad and repatriation. If you are planning a permanent move to Martinique, consult the UK Department for Work and Pensions (DWP) for advice on long-term entitlement as residents to health care provision under the French national system. Enquiries should be made to the DWP Overseas Medical Benefits help-line on 00 44 191 218 1999. Alternatively, information can be obtained direct from the English language service of the Caisse Primaire d’Assurance Maladie (French social security service) on 00 33 8 20 90 42 12 or CLEISS (the Helpdesk in France for international mobility and social security) on 00 33 1 45 26 33 4. If you need emergency medical assistance during your trip, dial 15 and ask for an ambulance. You should contact your insurance/medical assistance company promptly if you are referred to a medical facility for treatment. The hurricane season in Martinique normally runs from June to November. Monitor local and international weather updates from the US National Hurricane Centre website and check with local authorities or your tour operator for any changes to your onward travel plans. The Montagne Pelée volcano is dormant; it is monitored by a local observatory and there would be warning well in advance from the local authorities of any imminent volcanic activity. If you’re a British national and you have a question about travelling abroad that isn’t covered in our foreign travel advice or elsewhere on GOV.UK, you can submit an enquiry.We’re not able to provide tailored advice for specific trips.